Our chat with Ron Henkoff about a very special double issue. It started with a challenge from Bloomberg Media chief content officer Josh Tyrangiel to come up with something new and exciting. The result is the first front-to-back themed issue in Bloomberg Markets’ 23-year history. 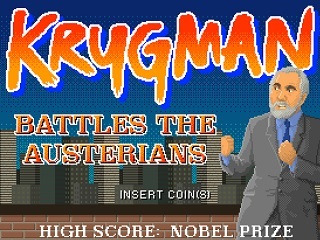 Echoing that editorial approach, the video game riff above featuring New York Times columnist Paul Krugman was drawn by Scottish artist Walter Newton. A native of Glasgow, Newton currently lives in Birmingham, England. Henkoff says there are all sorts of editorial treatments in the issue: standard-length features, shorter items, profiles, graphic novels, timelines and more. Readers can also look forward to pull-quotes sprinkled throughout, featuring people talking about their favorite rivalries and so on. “We are having a lot of fun with this,” enthuses Henkoff, a Boston native and Red Sox fan who is well-acquainted with one particular sports rivalry. The July/August issue cover is still being finalized; there will also be a component produced by Bloomberg TV.